From his arrival at No. 3 PRC in Bournemouth in April of 1944, Flying Officer William Smith could look back at what had been many months of hard work and devotion to learning his trade as a pilot. 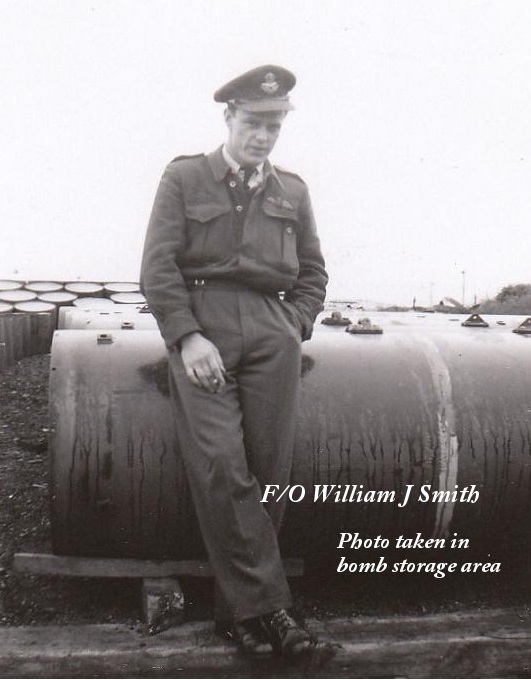 His enlistment on August 20th 1942 had been the first step, his next was to complete his training at a Manning Depot. For some it was a waiting game, others within days of enlisting were on their way to Manning Depots. For William Smith, "Smitty", learning to be patient would be in order. First a delay in posting to a Manning Depot and then again delays in postings to a I.T.School were ahead of him. After a number of months Smith was posted to No.8 Manning Depot at Souris Manitoba. A Manning Depot that is not well known and is only listed in a few sources. No. 17 SFTS was also located there. After two months at Souris he welcomed the chance to be closer to home came. No.16 SFTS Hagersville Ontario gave him time to visit his wife and two children, these few weeks of waiting for posting to an I.T.School could not have been better, his son was born and his family were together. and there again to wait his next posting. Sent out west to No.7 ITS in Saskatoon where after all the testing and examinations he was selected for the pilot training courses. On June 28th he was heading back East this time to No. 16 EFTS at St. Catherines, again close to home. This was followed by No.2 SFTS at Uplands near Ottawa. Graduating, receiving his wings and a commission September 5th. 1946. Two weeks Leave followed by Commando Training at No.1 AGTS ay Maitland NS before his March 30 embarkation to England. He was headed overseas on the HMS Andes an old ship built in 1913 and converted to a Armed Merchant Cruiser, headed to Liverpool. After a few weeks at Bournemouth he and a number of others were reposted to another PRC this time at Glouchester. Maybe his diary remarks sum up his feelings at that time. "pretty grim out look"
Perhaps the chance to fly again brought about better feelings, at No.21 (P)AFU experienced pilots taught new tricks and experiences to the arriving pilots. More training followed at No. 1534 BAT at Shawburt. Followed by the inevitable wait for the next posting. August 8th 1944 at No. 22OTU brought about that phrase in his diary again ""pretty grim out look" . It would be here that he put together his crew and learn to work together. As October 21st rolled around the completion of training at OTU and after nine days leave saw him and his crew at No.61 Base at Dalton for Commando training. Maybe his diary presents his thoughts on this "I didn't think conditions could be any worse, but they are..what a hell hole! 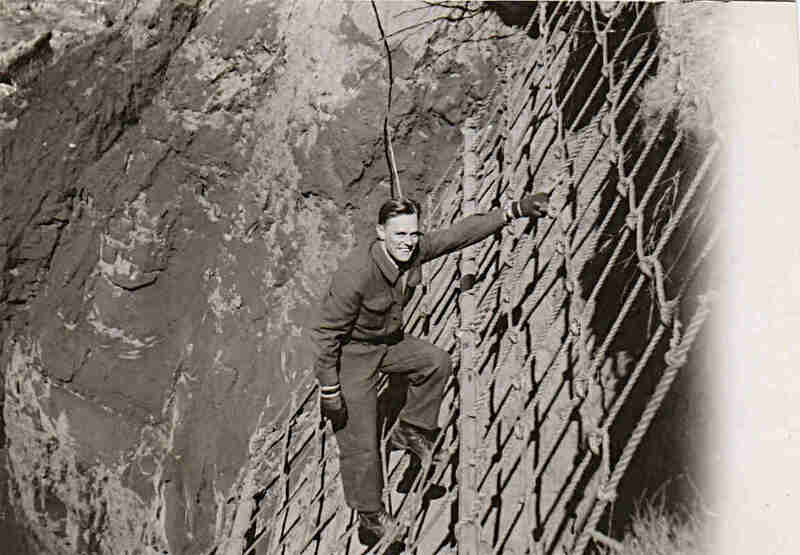 The Commando courses were taught by Army and often Commando instructors. The airmen were all reduced to the rank of private and only the cap with a white patch showed who they really were. Hand to hand combat, small arms and training with rifles filled part of the course. Evading capture and living off the land were a big part of the exercises. Being dropped off far from camp and finding their way home without the help of the local people was the big test. Home Guard would be on the lookout for them along with police and their instructors. Cheaters received a free ride back to the beginning. The beginning of December and F/O Smith was with his crew at No. 1664 HCU training on Halifax. Seven days ground school came first. By February 3rd the time at 1664, noted as "on a par with Dalton", broken up by nine days Leave in London during the Christmas holidays in the middle of the training. As the end of April of 1945 rolled round, the airmen could see the signs of the beginning of the end. The skies were still dangerous and 419 continued operations up until April 25th. The newly arrived crews seemed to be scrambling to get in at least one operation before the war was over. 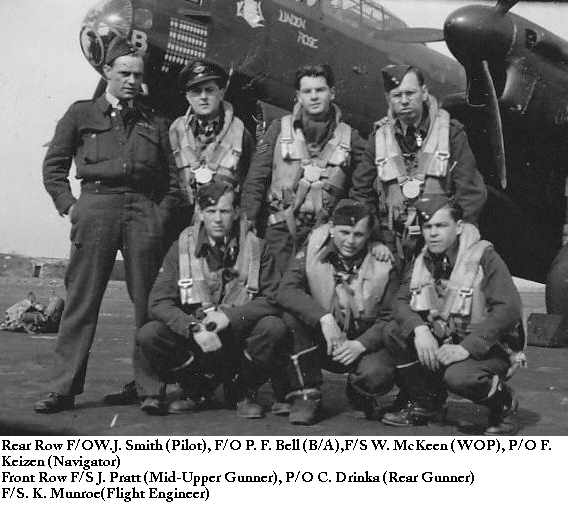 The squadron records show a number of new names of pilots taking part in the operations. All pilots had now to be trained in "Beam Flying" . And they all had to go back to training in a Link Trainer to become familiar with this type of guiding the aircraft from point to point. Navigators were heavily involved in learning Astro Navigation, taking every available opportunity to learn to navigate by the sun, which was doing it's best not to shine during the first week after V-E Day. Navigators were also listed as taking part in something called "Dry Swim" . The Wireless Operators were trained on Department of Transport procedures something that would allow them to communicate with the airports and flight path traffic they would be encountering at points along the route to Nova Scotia. With the cross country training, astro navigation and D.O.T. procedures completed the next step was the trans-Atlantic journey itself. F/O Smith, crew and some of the ground crew along with their kit and spare parts stored aboard take off for the long and some what indirect path for the shores of Canada. June 10th found Smith and KB721 among others taxing their aircraft to in front of the buildings of the RCAF Station at Digby. For many the last time they would be flying into danger, for others and the aircraft a short respite before the training and modifications for the Pacific war. After completing 54 operations and a second cross Atlantic journey KB721 would await another call to action which would never come. With the end of the war in the Pacific, "Tiger Force" was no longer needed. Aircrew men, ground crewmen would all receive their letters releasing them from duty. KB721 would serve on briefly now become a training aircraft and in use up until the 25th of November 1948.